Historic Home Renovation on Main Street in Moorestown, NJ | R. Craig Lord Construction Co. It was a unique challenge to create a corporate headquarters for Bayada Home Health Care in an 1858 home while undertaking a complete interior historic home renovation. 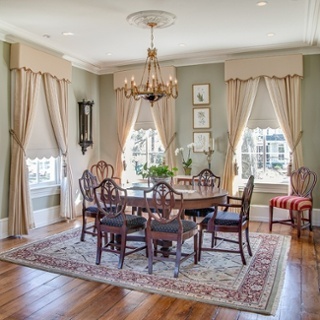 R. Craig Lord Construction Company, located in Moorestown, NJ, was ready for the challenge. First, a selective demolition uncovered clues to the past, but with only minimal original features remaining, the challenge began. A yearlong historic architectural investigation followed by a full demolition and almost a year of construction culminated in a historically impeccable renovation, despite only having twenty percent of the original features present at the start. 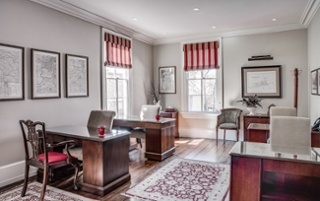 The result is a stunning and appropriate historic renovation blending period appropriate conference rooms and offices while maintaining commercial building codes and integrating modern conveniences. Key elements included: a three-story staircase with an octagonal oculus, sixteen room renovations including a Kitchen and three Bathrooms, custom woodwork and plaster, and a third floor with an open floor plan, and a rear entry ramp entering to a two-story foyer. 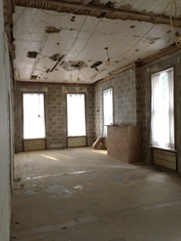 The completed rooms show the detailed work done and the before photos show the condition of the room before demolition. Behind-the-scenes photos of the above room before complete demolition. 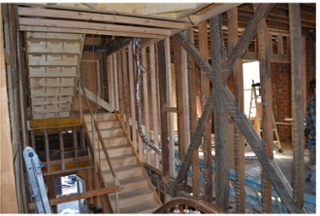 The three-story starircase went through major construction as you can see from these before and after photos. Since the building had undergone commercial remodels in the past, two drop ceilings and fake walls covered the original plaster walls and ceilings while segmented floorplans and layers of flooring hid the original layout. The scope began with a highly selective demolition, layer by layer, as clues were uncovered and documented of the home’s original features. Some of the details discovered included the outline or partial pieces of plaster cornices, ceiling rope trim and medallions, window trim and baseboards, lathe and brick walls, plaster walls, and window sashes. About 20% of the original features remained to restore and the other 80% were to undergo a year-long Historic Architectural Investigation before generating blueprints. The original features were removed to refinish offsite and the house was ultimately gutted entirely to the brick and lathe. Material acquisition was challenging for this historic remodel because most items could not be ordered from a supplier. 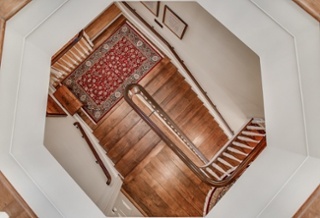 Materials involved recreating the historic features in the traditional manner by artisans who created custom plaster features and recreated woodwork, spindles and a two-story bannister to match the original first-floor staircase. All new HVAC, Electrical, Plumbing, and Wiring for technology was done to provide modern amenities. 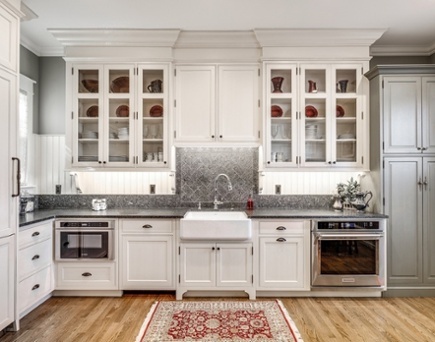 A Kitchen and three bathrooms were also added. Impressive Architectural details include a two-story rear entry which provides both elegance and views of the staircase from below. 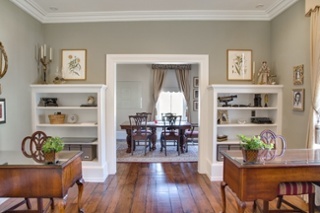 Office space and a break room were integrated seamlessly with 1850’s period details. 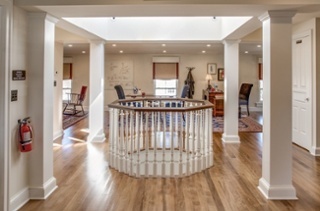 A third story renovation included a new floor plan and the addition of an octagonal oculus with views below. 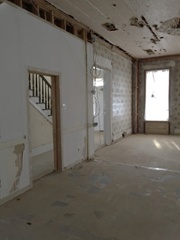 For a behind-the-scenes look at the demolition and construction of this renovation, checkout these past blogs. Blog #12, Blog#11, Blog #10, Blog #9, Blog #8, Blog #7,Blog #6, Blog #5, Blog #4, Blog #3, Blog #2, Blog #1. R. Craig Lord Construction Company is a Design Build Moorestown remodeling company which specializes in all types of home remodels and historic home remodels. We serve Moorestown, Mount Laurel, and Riverton, as well as the surrounding towns of Burlington County and Camden County. For more information, visit www.rcraiglord.com. Feel free to give us a call to discuss your project at (856) 235-4237 or email us through our website to schedule a consultation.